Ringling Circus Train and "Built To Amaze!" coming to So. Cal. 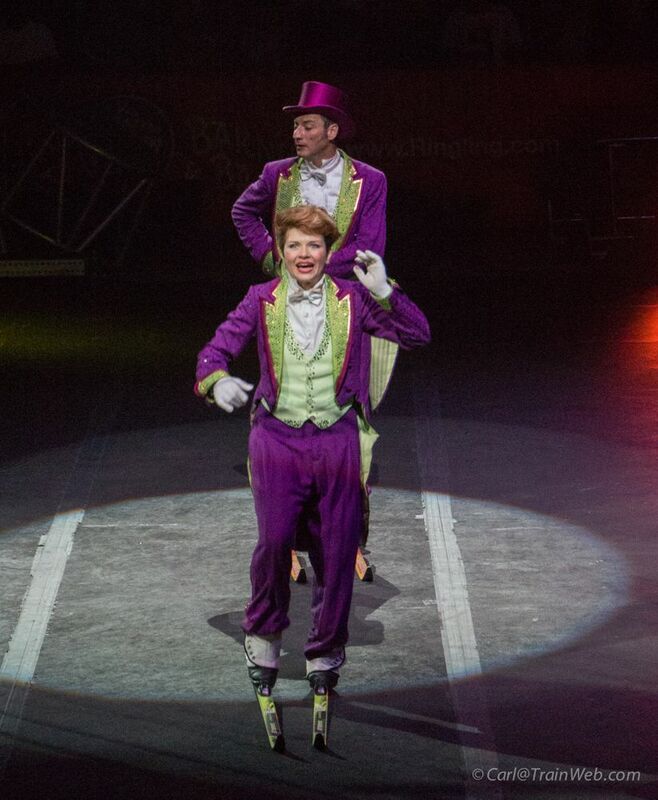 The Circus Train is Coming to Town - Los Angeles, Ontario, and Anaheim! The Anaheim Animal Walk has always been from the train at Cerritos and Sunkist to the Honda Center in Anaheim. 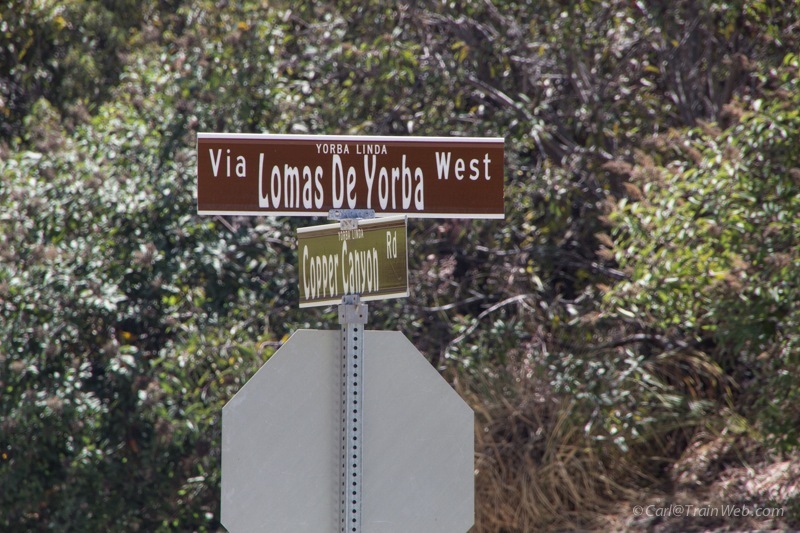 Others have said they contacted the local paper or the Honda Center for the time of the walk. 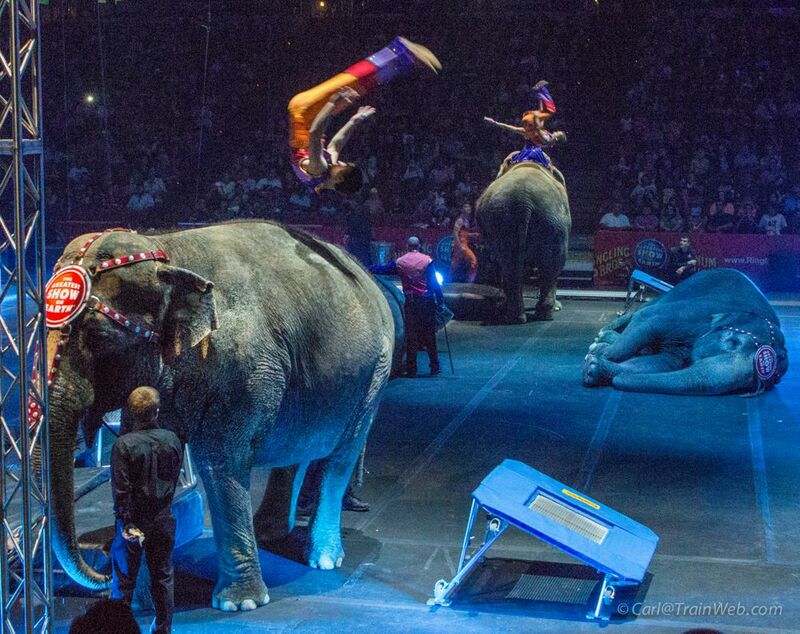 Ringling Bros. and Barnum & Bailey� Presents BUILT TO AMAZE! 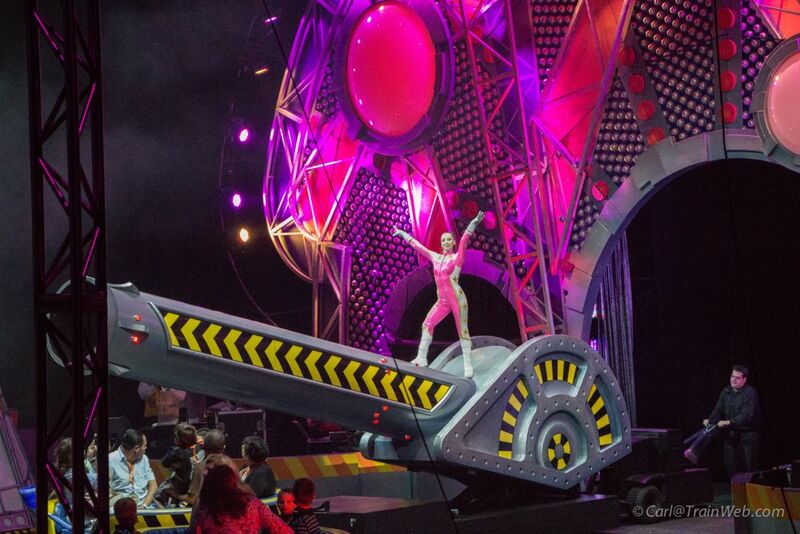 (Los Angeles, CA) - Ringling Bros. and Barnum & Bailey� Presents Built To Amaze!, an extraordinarily engineered circus experience custom-built for family fun where Children Of All Ages� find out what it takes to construct The Greatest Show On Earth�. 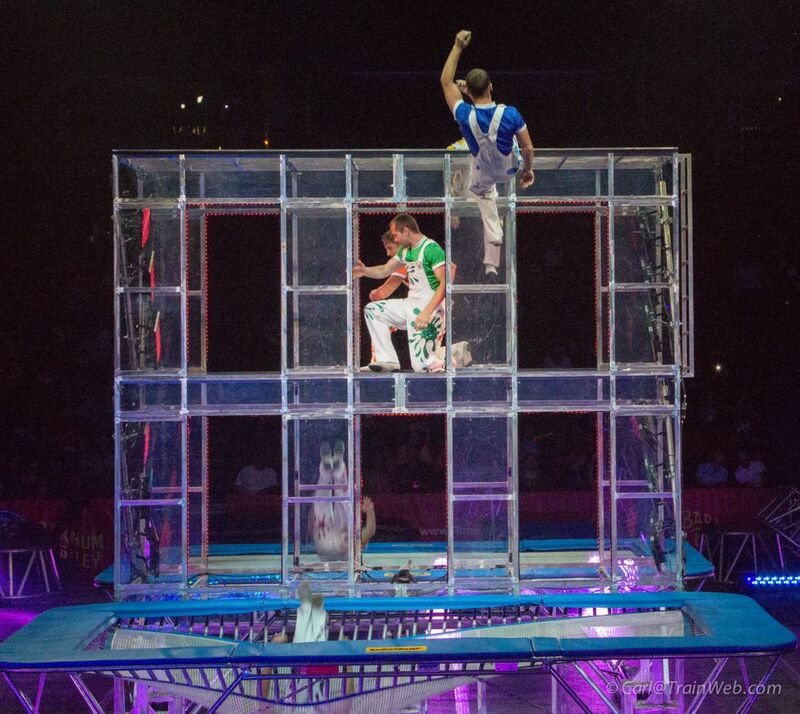 The visionary blueprints have been assembled with a contemporary toolbox of unparalleled imagination that will be unleashed from shipping crates right before the audience’s eyes for the all-new circus spectacular Built To Amaze! coming to the STAPLES Center Los Angeles (7/10-7/16); Citizens Business Bank Arena, Ontario (7/19-7/23); and Honda Center, Anaheim (7/26-8/4). Nine-time international award-winning comedic animal presenting duo Alex and Irina Emelin of Russia introduce their uniquely-designed brand of magic and humor with their remarkable trained animals including poodles, ferrets, rabbits, snakes and more! Tickets available for purchase online at AXS.com, charge by phone at 888-9AXS-TIX or in-person at the venue Box Office. *tickets may be subject to service charges, facility and handling fees. Tickets available for purchase online at AXS.com or CBBankArena.com, charge by phone at 888-9AXS-TIX or in-person at the venue Box Office. *tickets may be subject to service charges, facility and handling fees. 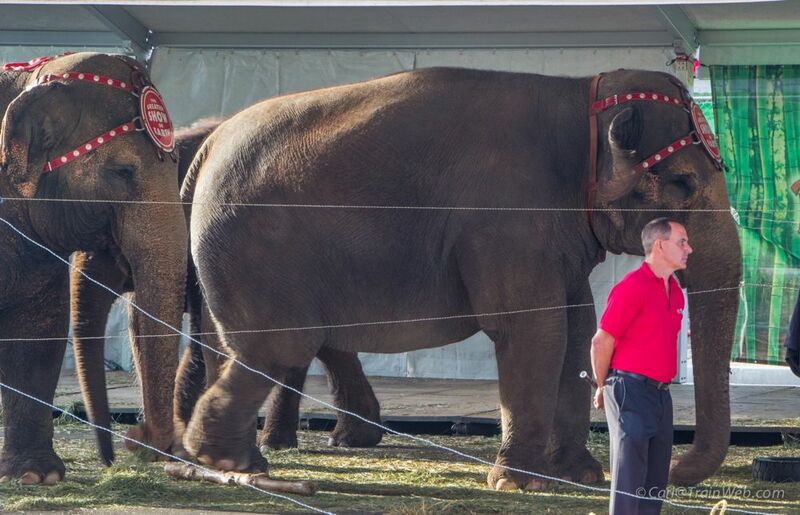 For more information, visit www.Ringling.com or on Facebook, Twitter and YouTube. 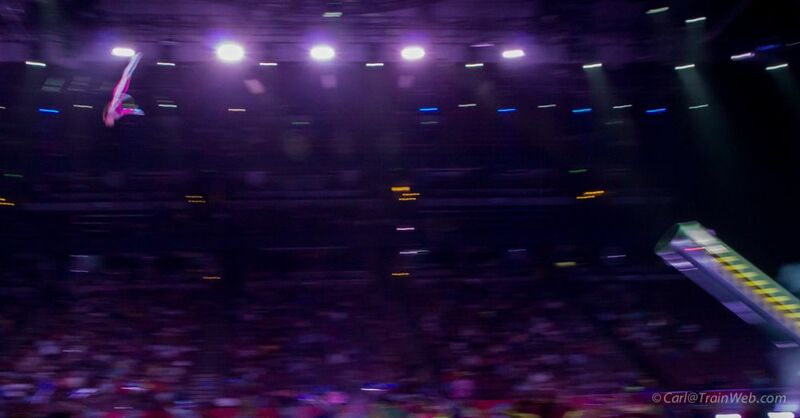 About Feld Entertainment: Feld Entertainment is the worldwide leader in producing and presenting live touring family entertainment experiences that lift the human spirit and create indelible memories, with 30 million people in attendance at its shows each year. 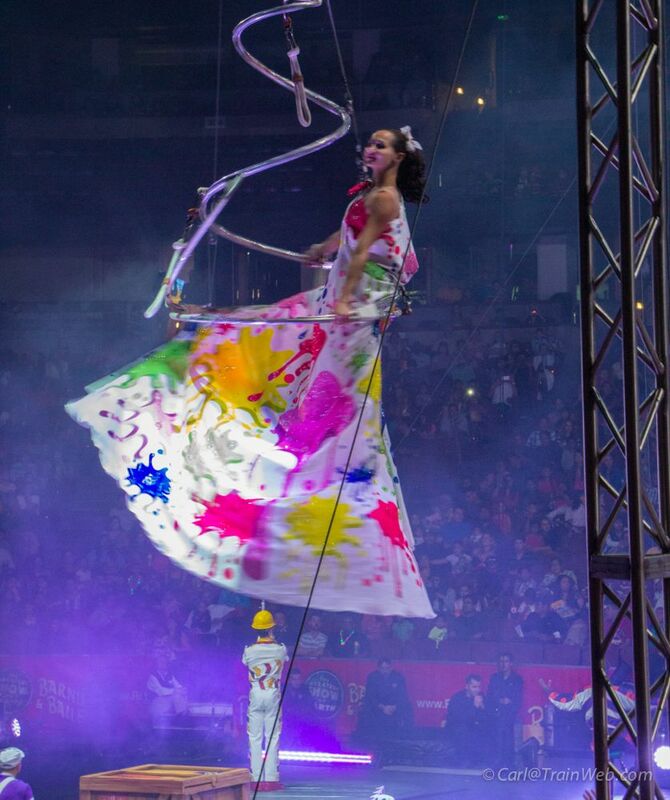 Feld Entertainment’s productions have appeared in more than 70 countries on six continents and include Ringling Bros. and Barnum & Bailey�, Monster Jam�, Monster Energy Supercross, Nuclear Cowboyz�, Arenacross, IHRA Drag Racing, Disney On Ice and Disney Live! 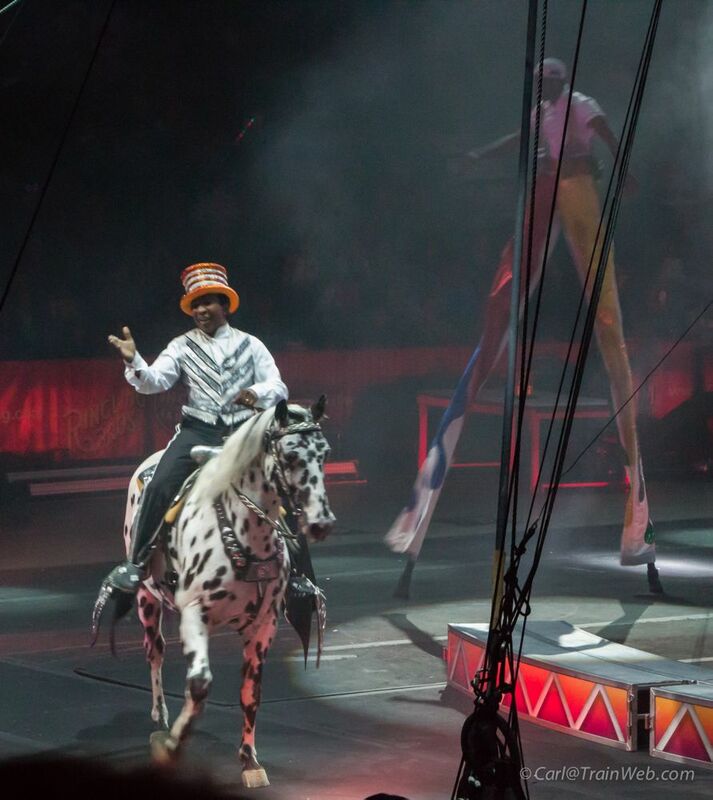 The Trainmaster of the Red Unit of the Ringling Bros. and Barnum & Bailey Circus is Lonnie Robinson. 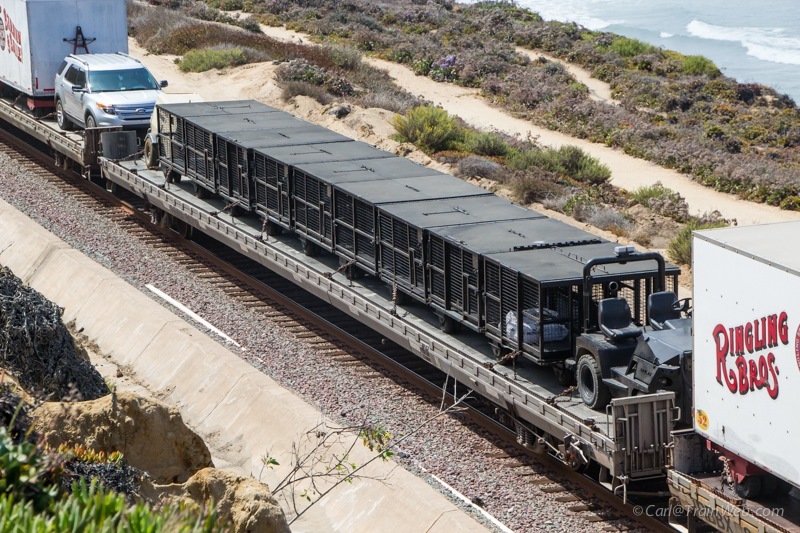 In a telephone interview with him when the show was in Phoenix in June, Lonnie listed the consist for me: 4 animal cars; 34 coaches, which includes a generator car and shop car, 2 container cars for concessions; and 19 flatcars. Lonnie is from Austin, Texas, and has worked his way up to being Trainmaster of the Red Unit. 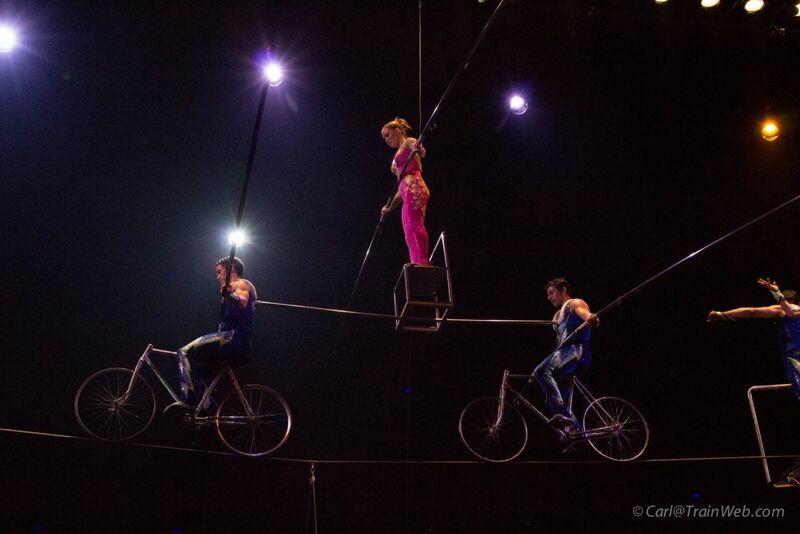 The Red and Blue units of the Circus make up two new shows every two years. They then go on tour for 11 months and 1 week one year and 10 months and 2 weeks the second year. I mentioned seeing the Trainmaster in recent years changing wheel sets during their Anaheim stay. Lonnie mentioned that they carry two wheel sets under the shop car and that they have wheel sets stored around the country for use when needed. I know that the Blue unit, with Joe Colossa as Trainmaster, went to Mexico this year, but Lonnie said the Red Unit had gone there last year. 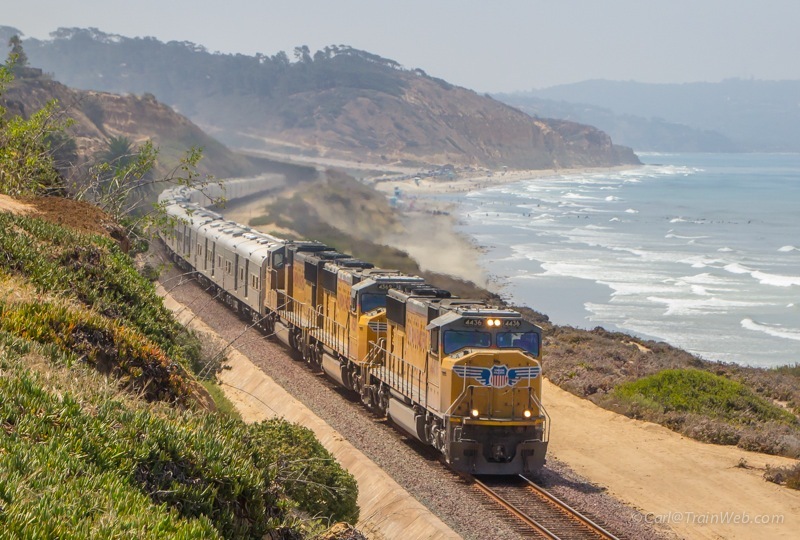 I asked if the stereotype of a dilapidated rail system in Mexico was still true, and that they did not run with signals, but rather they run by radio as they did when I rode the rails there in 2004. He said he was surprised also, but they have all new rails and concrete ties and the ride was great. He said the circus is sold out for years in the future in Mexico. The Red Unit went non-stop from Laredo, Texas, to Mexico City. The only down side, according to him, was that they had to skip New Orleans and Corpus Cristi to get the time to go to Mexico. 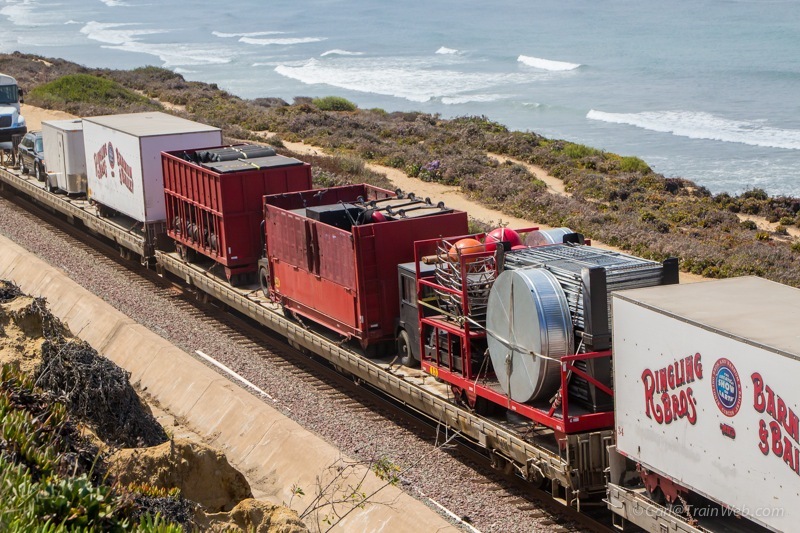 He said that circus management and the trainmasters all have positive things to say about taking the longest train in the world to Mexico for shows. The show has changed so the animals may be different this year, but the train is the same. 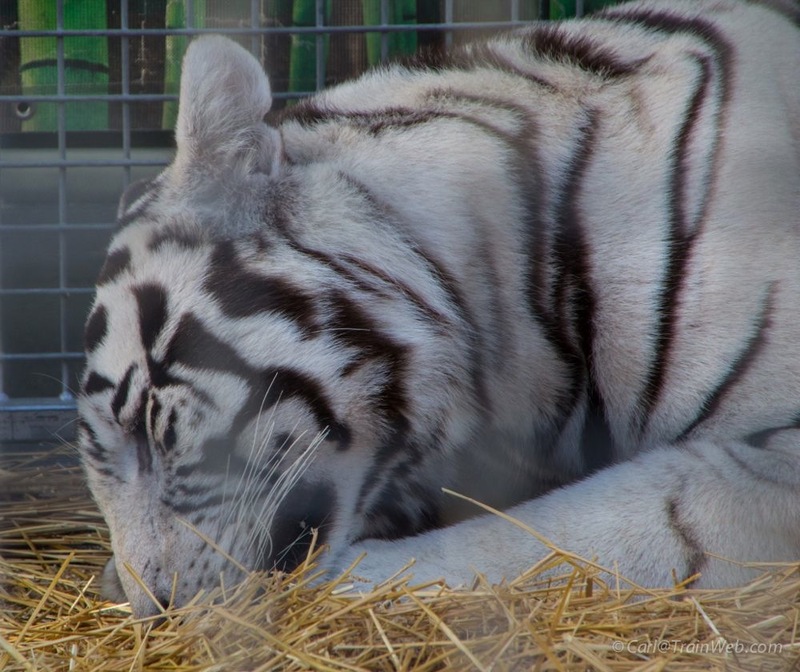 "How to Take Great Travel Photos"
The "Animal Open House" is 90 minutes before showtime. 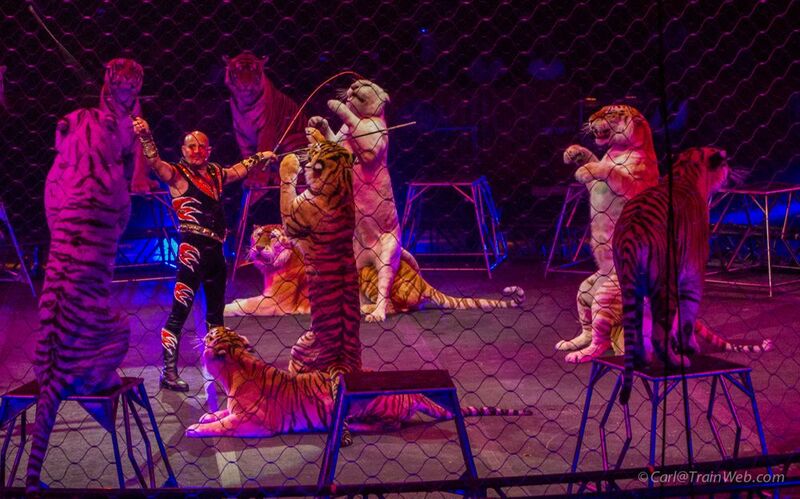 At that time you can see tigers through double caging (thus the blur in the tiger photos), and other animals in the show. 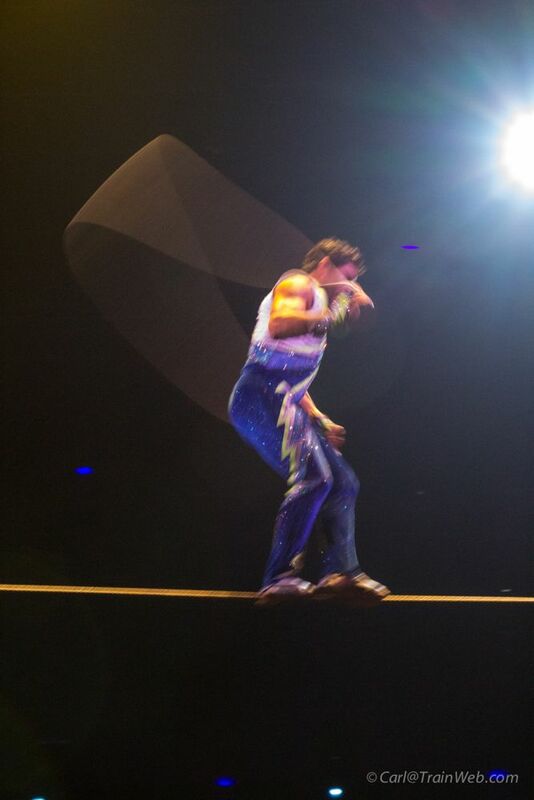 After a one-hour pre-show on the floor of the arena where performers interact with the kids, the show starts with the grand parade and National Anthem. 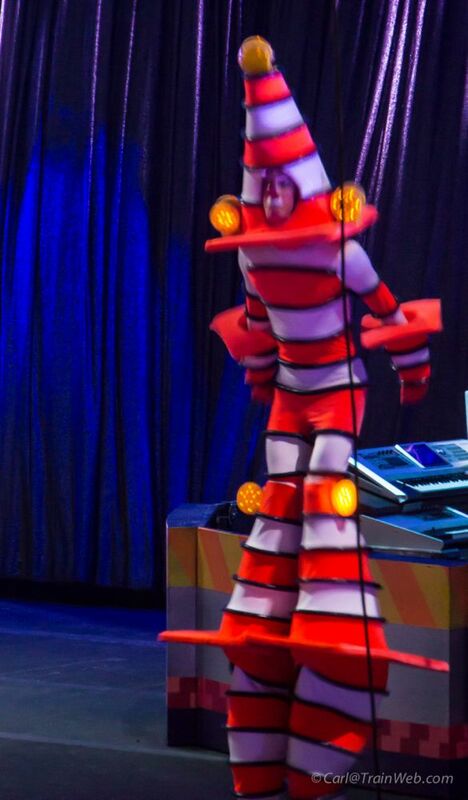 The theme, Built to Amaze, included this performer dressed in traffic cones and caution flashers. 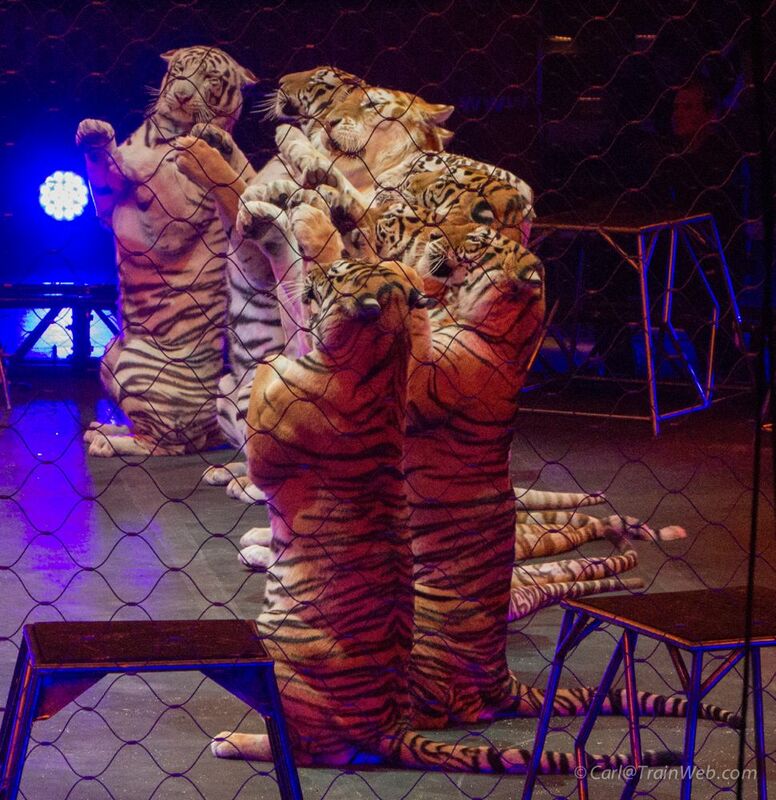 Tabayara Maluenda performs with 17 tigers at once. 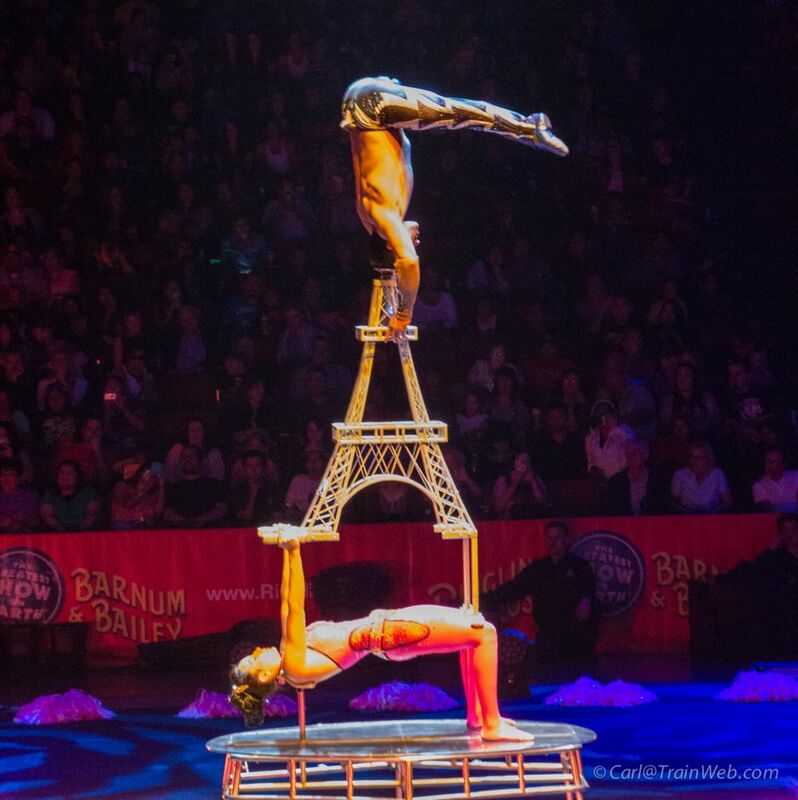 Duo Solys (above and below) executes a never-before-seen hand-balancing routine that incorporates Cuban and French culture. Elliana Grace after experiencing 7 Gs again. 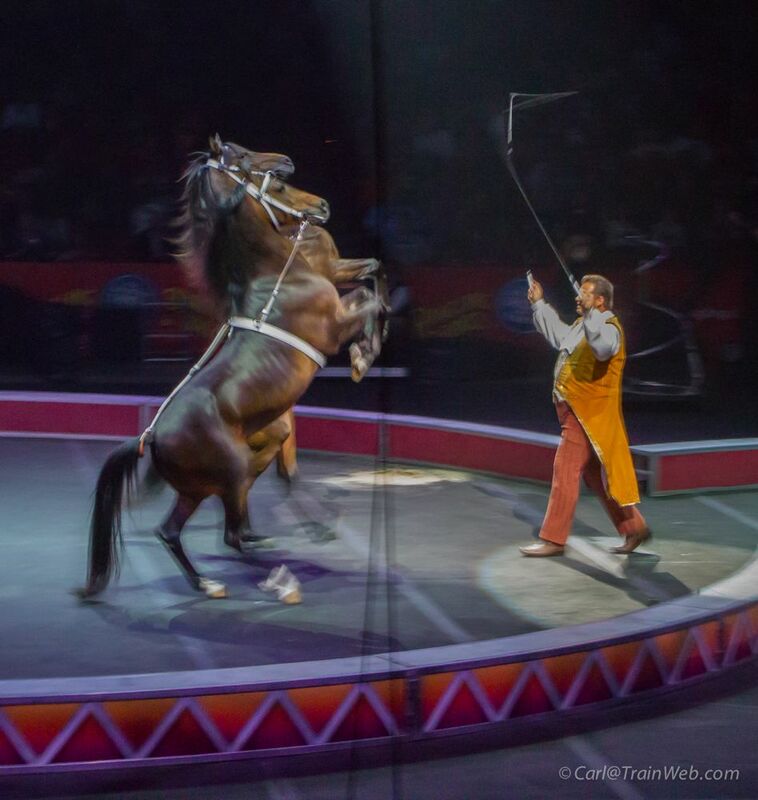 In addition to being a Ringmaster, Andre McClain is an accomplished animal trainer, cowboy, rodeo star, country singer and songwriter, and above all, an admired dad. 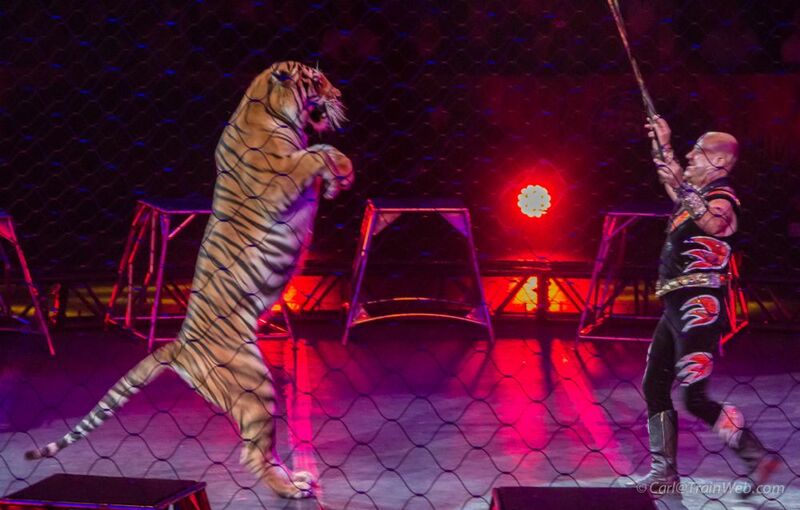 I have seen Andre McClain come up through the ranks the last 6 years with Ringling with an animal act, as a pre-show MC, and now the Ringmaster. Alex and Irina Emelin (above and below). 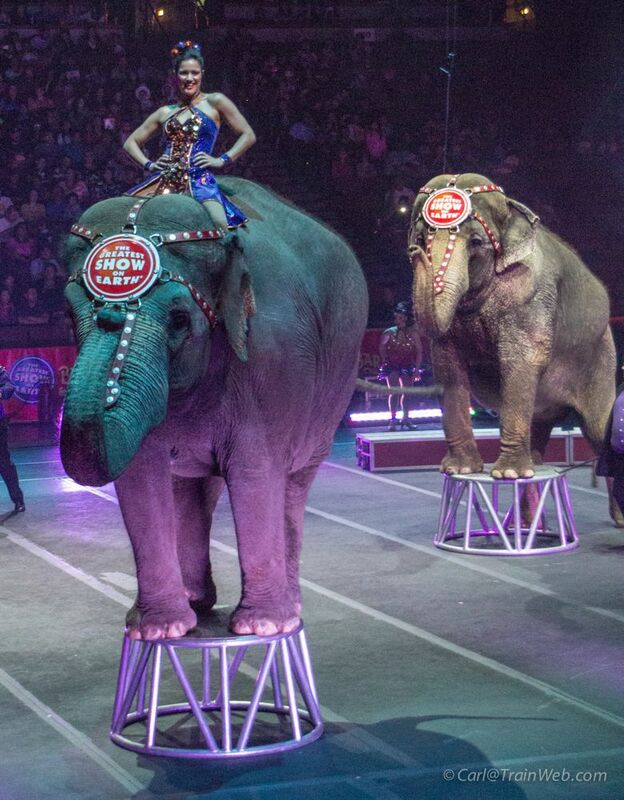 The elephants are my favorite act, not only because they live on the circus train, but they are the biggest mammals I've ever seen yet they are so gentle and talented. 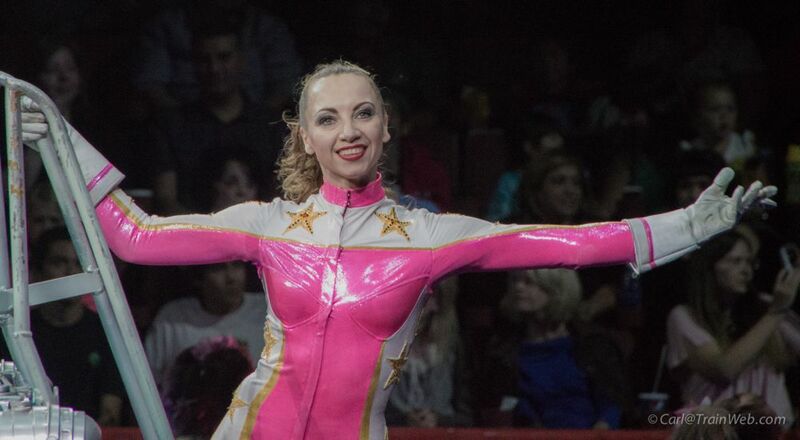 Yulia Negrey is the creater of the Negrey Troupe from Russia, Kazakhstan and the Ukraine which includes former Olympic athletes. 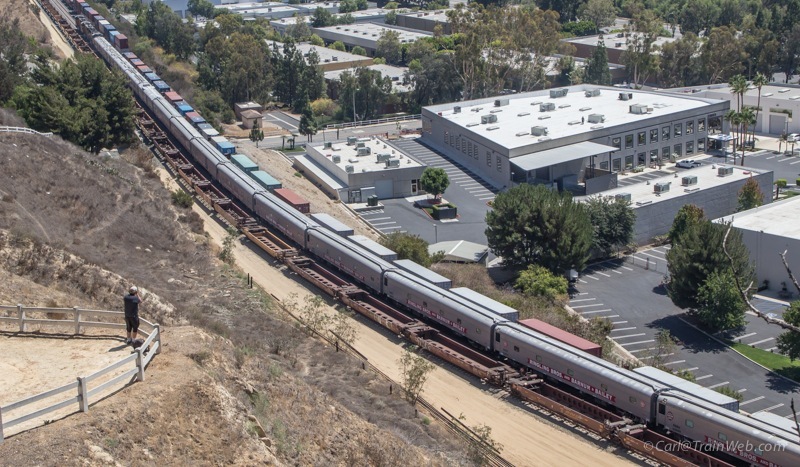 Another exciting circus show transported by train moves out of Anaheim to perform again in San Diego. 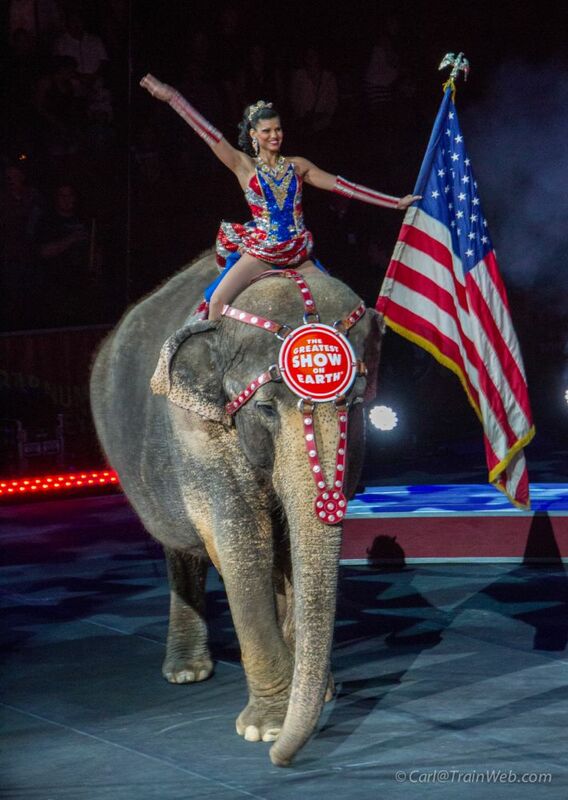 To see when the circus will be in your town, you can go to: Ringling.com, and click "Tour Schedule". 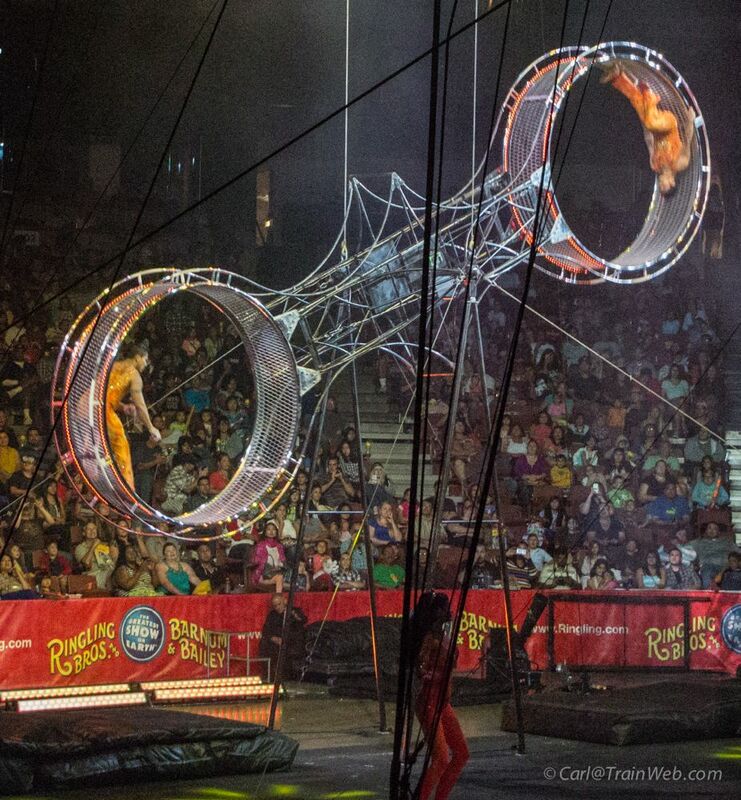 Learn more about the many great performers in the show by going to Ringling.com and clicking "Explore the Shows" then "Meet the Stars". 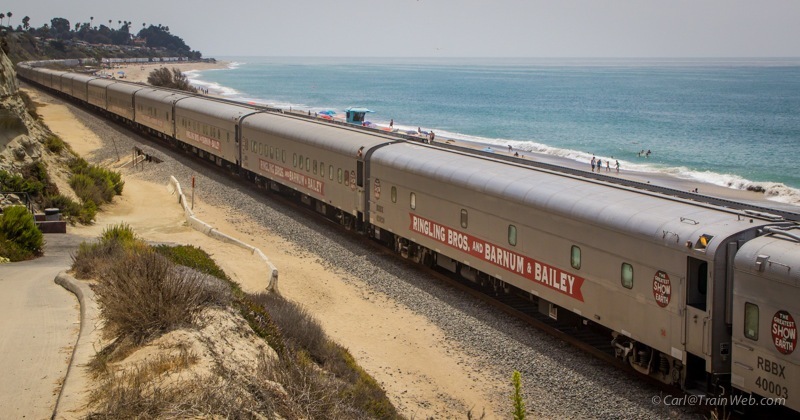 As the Red Unit of the Ringling Bros. and Barnum & Bailey Circus left San Diego on August 12, 2013, fellow TrainWeb.com field reporter Chris Guenzler and I went to Del Mar, California, to take a few photos of the train from the Del Mar bluffs. 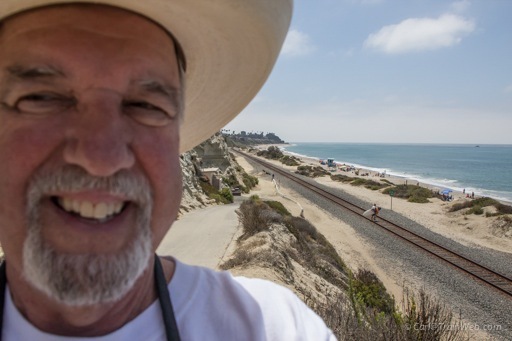 Chris knew that if we parked at the west end of 7th Street in Del Mar that would get us out on the bluffs where we could see south all the way to the Hwy. 101 bridge over the tracks. Locals might know where "Wally's Bench" is located and that is where we rested while waiting from 7 a.m. to 11 a.m. for the train to be coupled and to reach us. 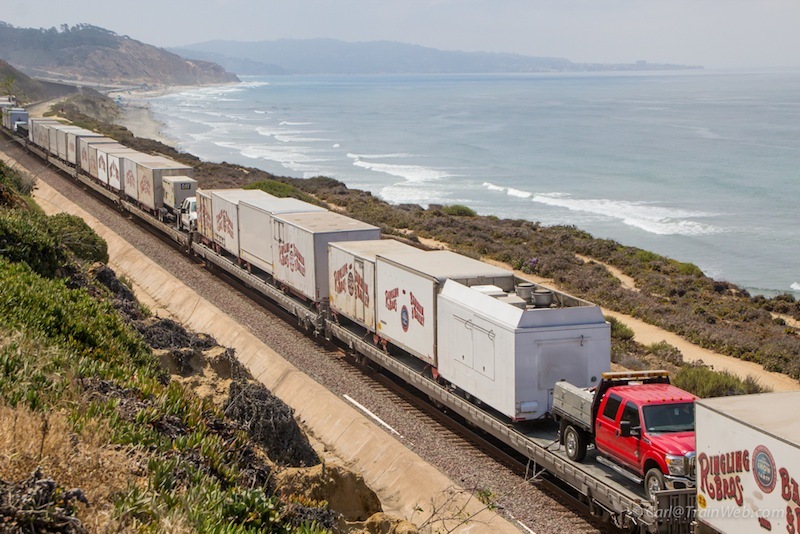 Our position allowed us to see much of the 59 cars of the circus train as it stretched back to the Hwy. 101 bridge of the tracks with Torrey Pines in the distance. As usual, the animal cars are first with the residential cars for over 200 performers, staff, and crew following. 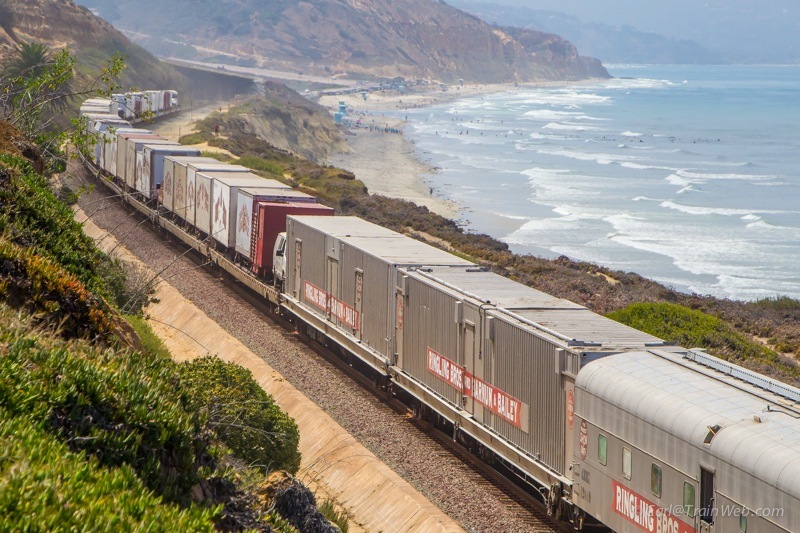 Following the residential cars are two container cars, then the flats which haul the circus wagons and equipment. The white wagon behind the red truck is the Pie Car Jr. which provides food to the performers and staff at the venue when they are between shows. 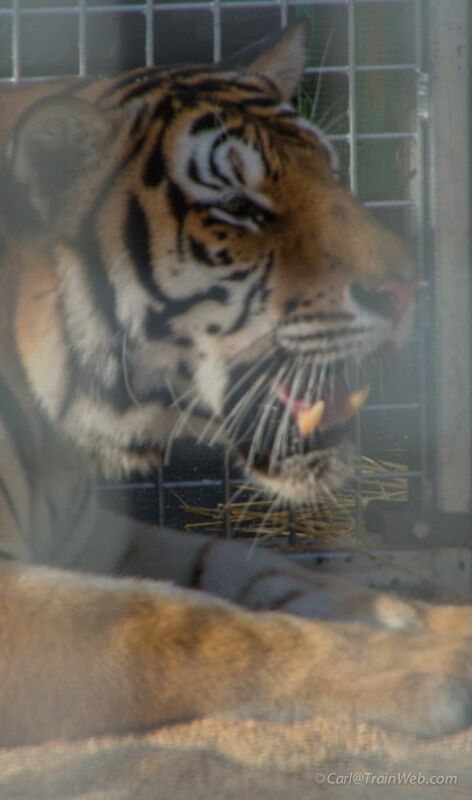 The tiger cages are used to bring the tigers into the performing ring. 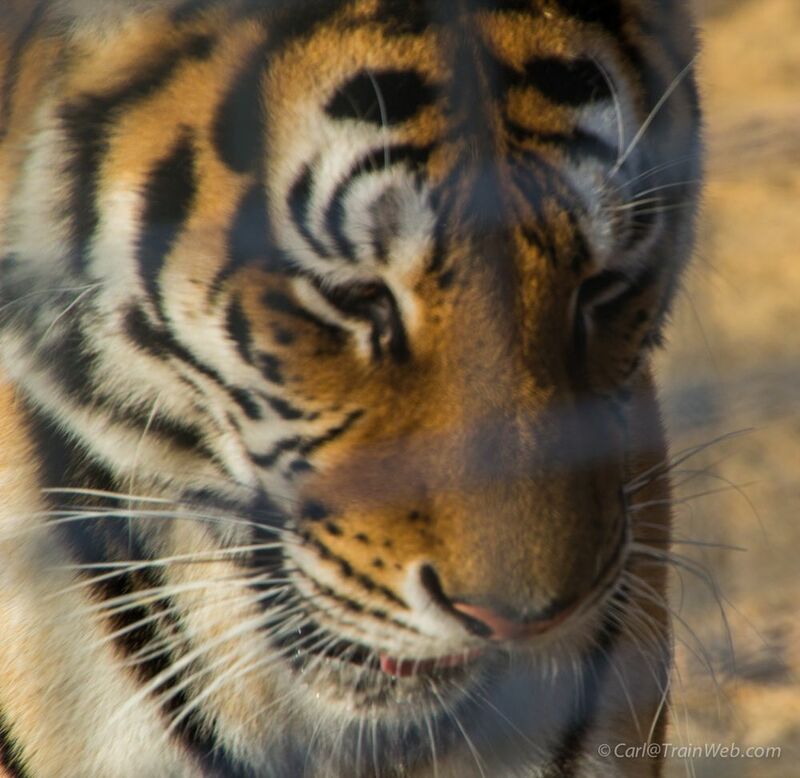 Tigers do not travel on the train, but rather are transported in semi-trucks. 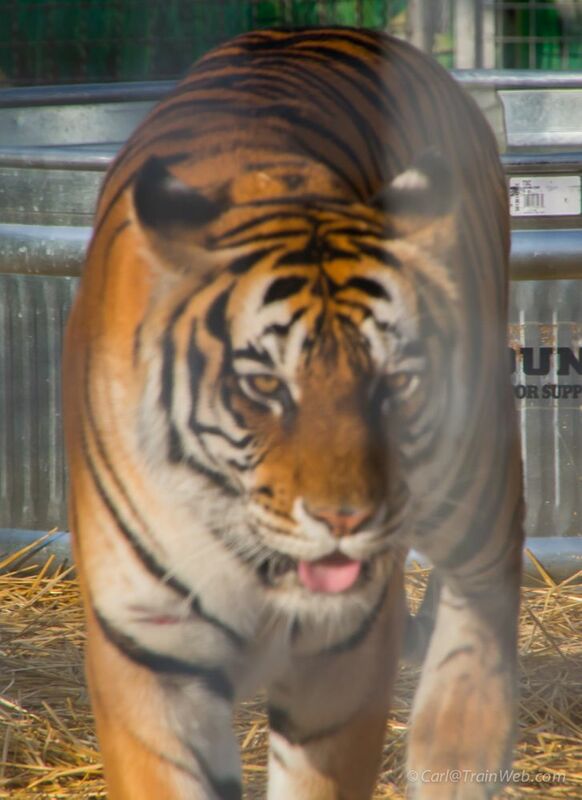 The large round water trough is inside the tiger cages at the venues so they can cool off and play in the water. Chris Guenzler watches the last flat with the bus which takes the performers from their living quarters on the train to the venue for shows. 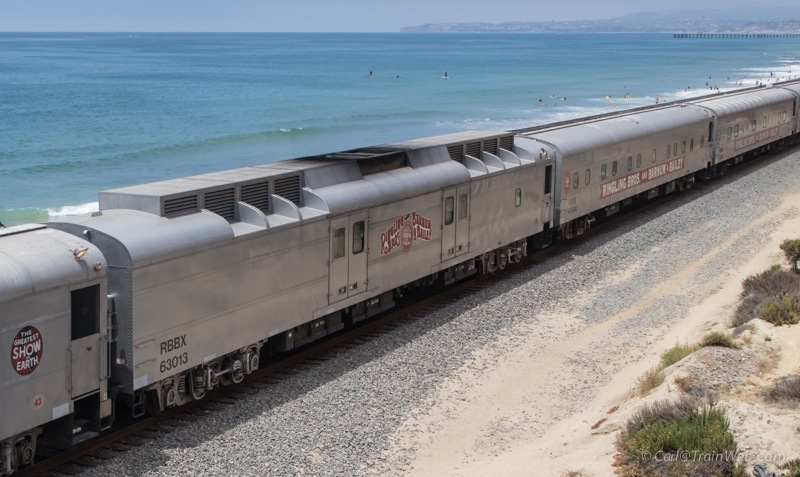 We drove north from Del Mar to Calafia Beach in San Clemente to view the circus train making its way northward from San Diego on its way to Oakland, California. 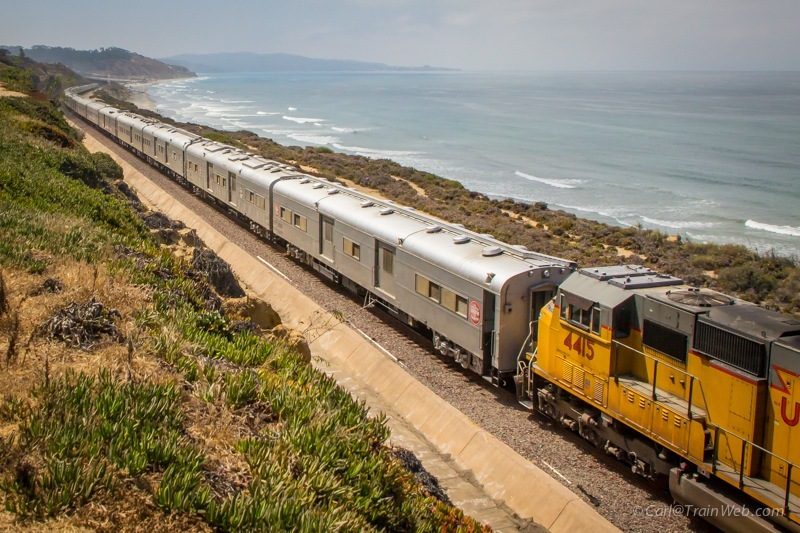 We parked, paid our $2 for one hour of parking, and walked on the inside of the track, south, to a nice seaside vantage point for seeing the circus train coming up from San Onofre. This spot, next to a road which comes down from the public campground, also has a bench and restrooms at the bottom of the hill. Within the hour, a few Coaster trains passed as well as the circus train. 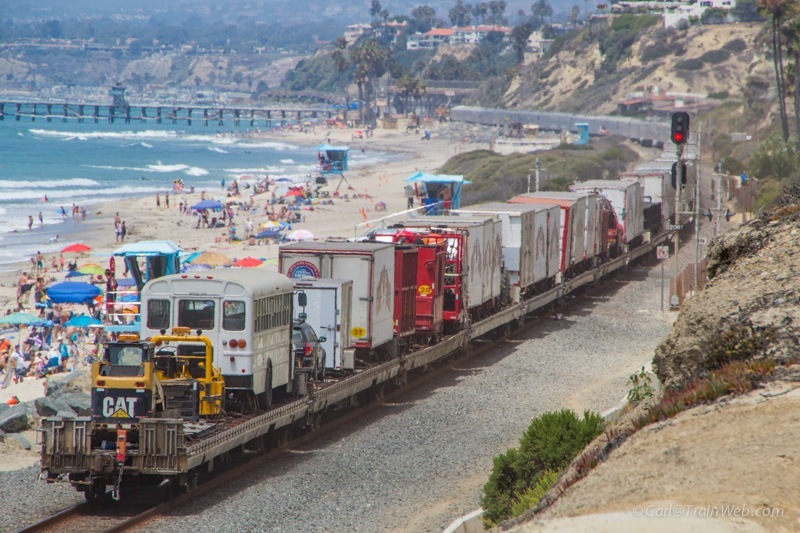 At Calafia Beach, half way up the bluff, you can see almost all the 59 cars of the circus train at once. 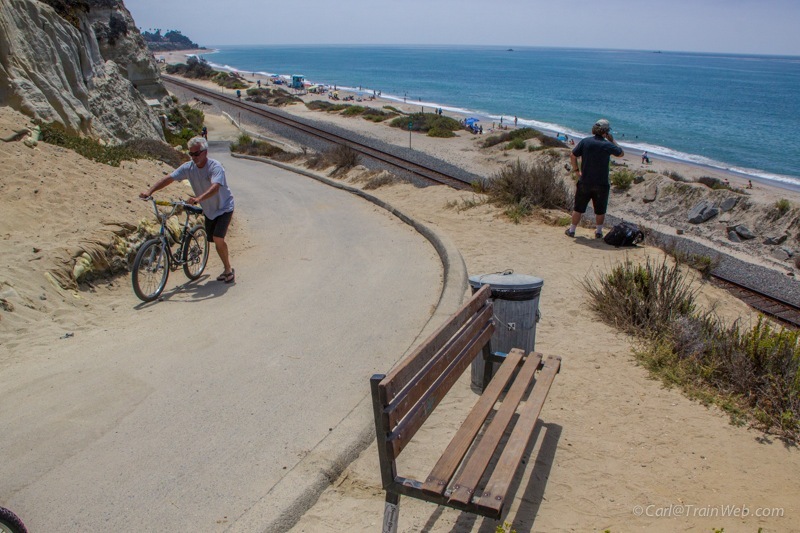 Looking north, you can watch the train while it goes to San Clemente Pier and beyond, along the coast. 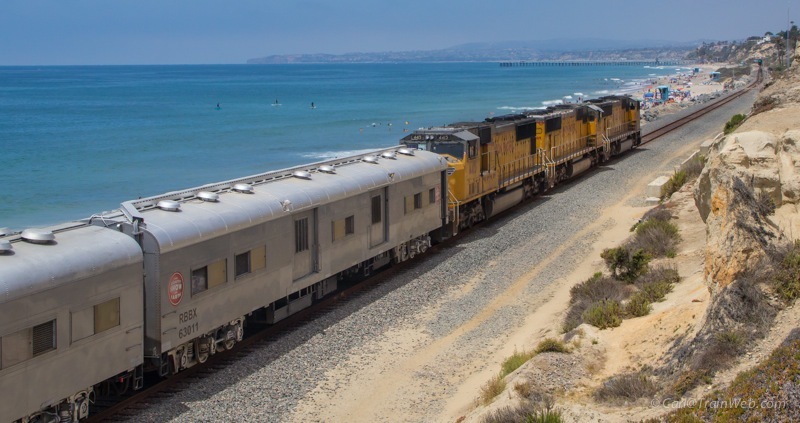 This is a nice place for an ocean view from the Surfliner and Coaster commuter trains as well as the circus train residents once a year. As the first residential coaches passed us, we could see the last flat in the distance coming around the corner along the surf. A new generator car has joined the red unit since I last saw it two years ago. None of the dog walkers, runners, and surfers we talked to this day, who asked us what we were photographing, had any idea that the Ringling Bros. and Barnum & Bailey Circus traveled by train much less that they have 2 trains either one being the longest private train in the world. Chris and I gave them our TrainWeb.org/Chris and TrainWeb.org/Carl cards so they could learn about and see more photos of the circus trains. Finally, we drove up the toll road from I-5 to Hwy. 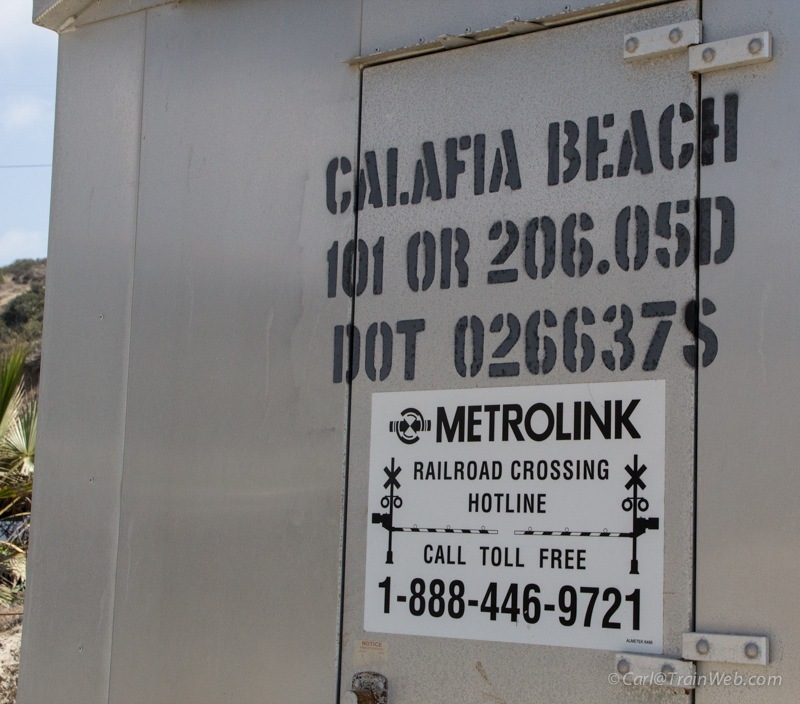 91 near this location in Anaheim for our final sighting of the circus train for this year. We have had better situations on this triple-tracked horseshoe curve. 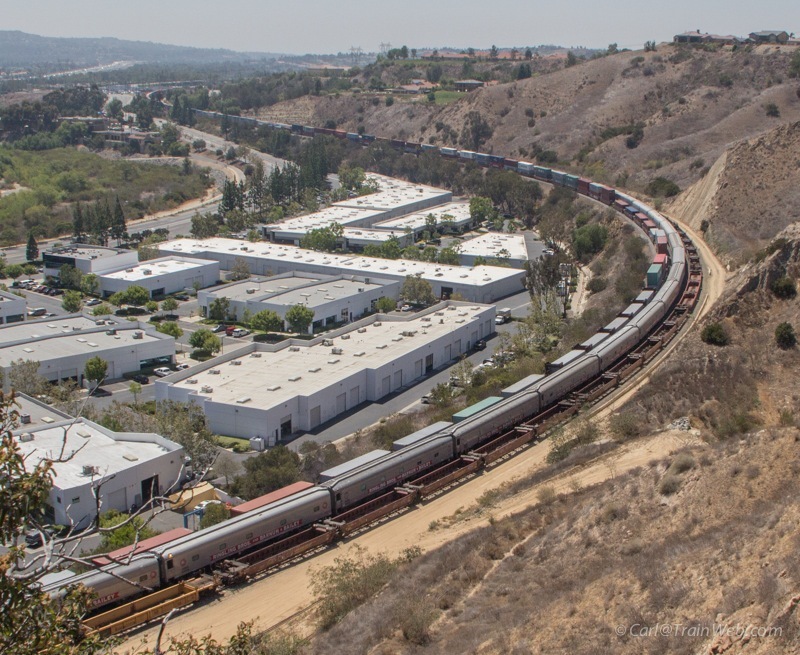 Today the circus train was on the middle track in between some stored container cars and a container train. Even at that it was better than if it was on the far track beyond a stack train. 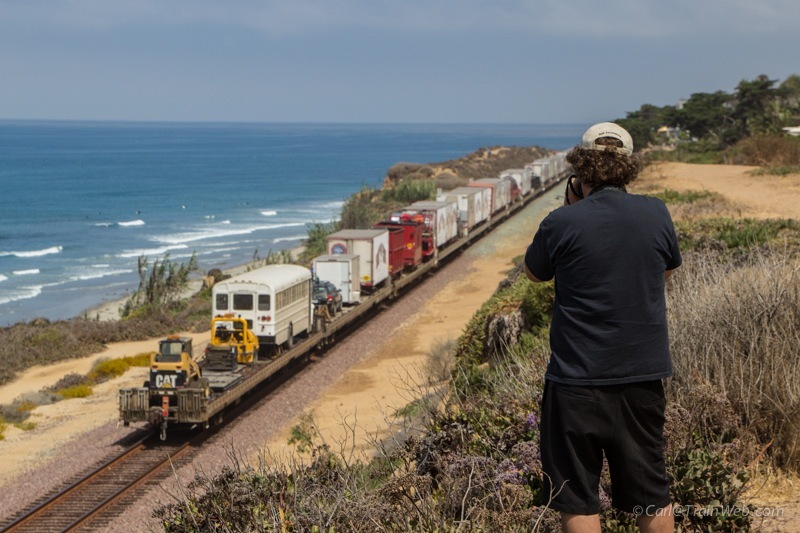 With the three locations in two counties for shooting the 2013 red unit circus train under our belts, we headed home satisfied with the shots we had taken and the extra benefit of sitting on a bluff on Wally's Bench watching the surf in 63 degree weather. Thanks Chris for asking me if I wanted to "Go chase the circus train." 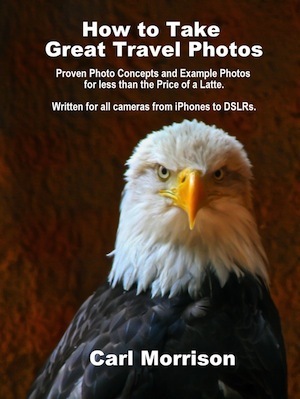 My New eBook on "How to Take Great Travel Photos"